Azad was detained while leading a procession that included cars and motorcycles, but was shifted to the hospital when he took ill.
LUCKNOW: Soon after Congress leader Priyanka Gandhi Vadra met him at a Meerut hospital on Wednesday evening, influential Dalit leader and Bheem Army chief Chandrashekhar Azad said he would contest from Varanasi against PM Narendra Modi. “I won’t let PM Modi win his seat from UP in this election,” said Azad. However, it is not clear if the Congress would support him in Varanasi. 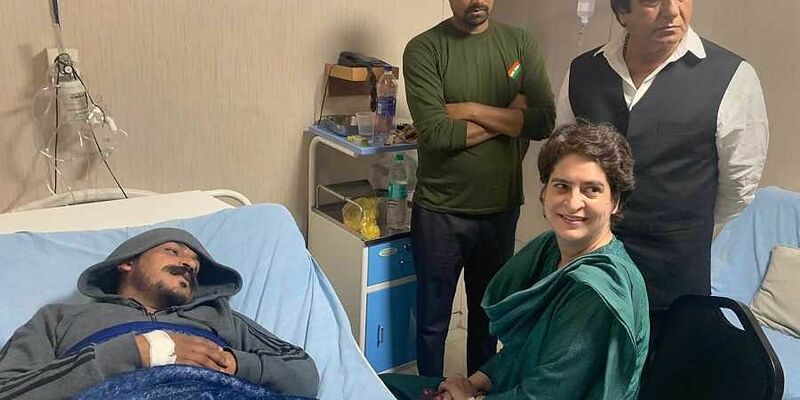 In what is being seen as a Dalit outreach move, Congress’s newly appointed general secretaries—Priyanka Gandhi Vadra and Jyotiraditya Scindia— paid a visit to Bheem Army chief Chandra Shekhar Azad at a Meerut hospital on Wednesday evening. Accompanied by UP Congress Committee chief Raj Babbar and other Congress leaders, Priyanka Gandhi Vadra and Jyotiradatiya Scindia, party in-charge of eastern and western Uttar Pradesh respectively, drove down to Meerut to meet the self-proclaimed Dalit leader in the hospital. Azad was arrested for allegedly violating the model code of conduct by taking out the Bahujan Hunkar rally in Deoband in Saharanpur on Tuesday. While an FIR was lodged against him and his supporters, he was taken to a Meerut hospital after he fell sick in custody. Bhim Army’s Hunkar rally was flagged off on March 11 and was supposed to culminate in Delhi at Jantar Mantar on March 15. Chandrashekhar was expected to mobilise Dalits in Muzaffarnagar on Tuesday. After meeting him, Priyanka extolled Azad for his struggle towards Dalits’ emancipation. “I have come to meet him as I appreciate his zeal to fight for the rights of Dalits. He is trying to raise his voice but this government has become so boisterous that it does not want to listen to him,” Priyanka said while interacting with media persons after the meeting. She said that it was an apolitical visit and her meeting should not be seen with a political lens. However, talking to the media persons after Congress leaders visit, the Dalit leader claimed that he would contest Lok Sabha election against PM Modi. “I won’t let PM Modi win his seat from UP in this election,” said Azad. However, political pundits scoff at it as a mere political gimmick by the Bheem Army chief. On the contrary, speculations were rife that Congress may field him from Nagina which is a reserved constituency in western UP. Political pundits take the Congress’s move of reaching out to Azad as an attempt to breach Dalit vote bank of the BSP. In fact, western UP has a dominant Dalit-Muslim electorate seemingly dedicated to the BSP. But the Dalits drifted away from BSP in 2014 Lok Sabha and 2017 Assembly elections in UP. Muslims make around 26 per cent of the western UP population which is more than the whole of state accounting for 19.6 per cent. Similarly, around 22 per cent of the population is Dalits in this part of UP. Considerable 17-30 per cent are jats. Priyanka’s gesture also takes significance in the light of Mayawati’s stand of not having any pact with Congress in any of the states. This brought curtains on all the efforts allegedly being made by the SP to rope in Congress in SP-BSP alliance to minimise division of the non-BJP votes especially when the narrative has taken a nationalist tinge post-Pulwama terror attack and subsequent airstrikes. Azad has been quite close to Imran Masood, the Congress strongman of Saharanpur in western UP. However, after being released from the jail last year in September by the Yogi government which revoked NSA prematurely against him, Azad straightaway went to meet Masood. The Bheem Army chief, who has some clout among western UP Dalits, announced his open support to SP-BSP alliance. He backed Mayawati as the next PM saying he had a natural inclination towards BSP chief as he belonged to her caste. Mayawati, on the other, refused to give him any traction. She rejected his political overtures. Mayawati said her party would not have ties with a person who had a history of indulging in anti-national activities and hooliganism. As per the political observers, Azad closeness with Congress’s Imran Masood annoyed Mayawati. She even slammed the Bheem Army chief publically accusing him of misguiding Dalit youths in the name of their emancipation. In the given scenario, Congress’s gesture may be a prelude to its plan to get some hold on Dalit society through Azad.